A new Filipino spot has made its debut in the neighborhood. 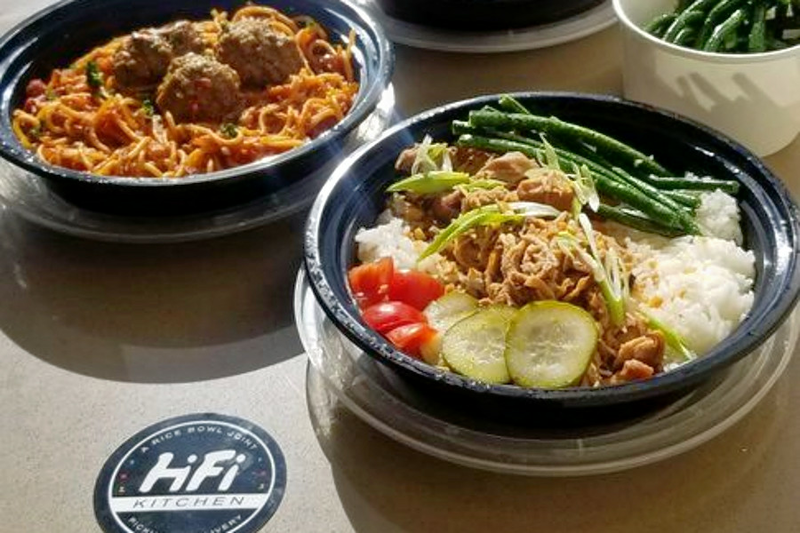 The fresh addition to Historic Filipinotown, called HiFi Kitchen, is located at 1667 Beverly Blvd. The casual take-out and delivery spot serves Filipino-American comfort food dishes like chicken adobo and pork belly with sauteed vegetables served over rice. There are vegetarian options as well, including a savory tomato stew and marinated mushrooms. Side dishes include lumpia, a Filipino spring roll, and tinola, a chicken soup served with wedges of green papaya. A number of desserts from Creme Caramel LA are also available, including ube upside-down pie and halo halo pudding. Char B., who was among the first Yelpers to review the new spot on Jan. 26, wrote, "The la'ing (dried taro leaves in coconut milk) was delicious. I believe they said it did not have shrimp paste in it, making it a vegan option. The interior is clean and bright with a dope mural of subtle quirky icons pertaining to the Filipino culture." And Alwyn S. wrote, "The chicken adobo and lechon kawali are the bomb with a hipster twist in it. Also, try the ube creme pie. The spot is harder to find, but the name of the place makes up for it. "